What could be better than having three great Eventide plug-ins to mix with? The Ultra Essentials bundle gives you exactly that with their new Ultra Essentials bundle. 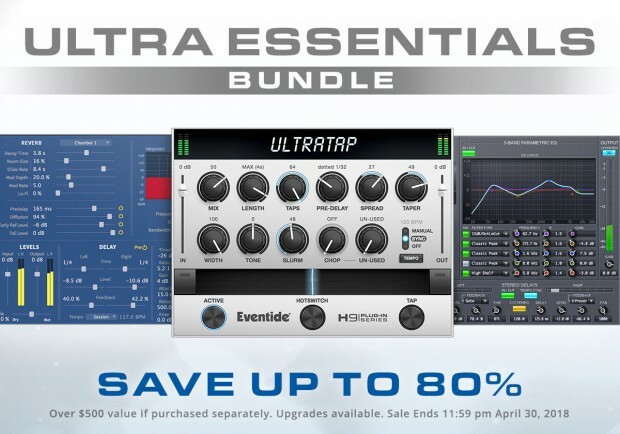 Designed as the ultimate core set of plugins for producers, engineers and sound designers, the Ultra Essentials Bundle features three of their most powerful plugins: UltraChannel, UltraReverb and UltraTap. Whether you are mixing or tracking a record, live sound or post production, Ultra Essentials will make everyday tasks easier and fire your imagination. The bundle comes with more than 600 presets across the three plug-ins, many designed by Eventide artists including Andrew Scheps, Chris Carter, Richard Devine, Sasha, ROCASound, Brian Montgomery, Matt Lange, Colin Newman and many more. Valued at over $500 if purchased separately, bundles are the most affordable way to own Eventide’s award-winning tools. Starting today until the 30th of April you will be able to purchase it at the special introductory price of $99. A saving of $200 on the list price of $299 which comes into effect on the 1st of May. The Ultra Essentials bundle is available for only $99 at the DontCrack Store. This entry was posted in DontCrack, Plug-ins, Promotions and tagged Eventide, Ultra Essentials bundle, UltraChannel, UltraReverb, UltraTap. Bookmark the permalink.